Matriarch of renowned golf course design family served as first female ASGCA president. 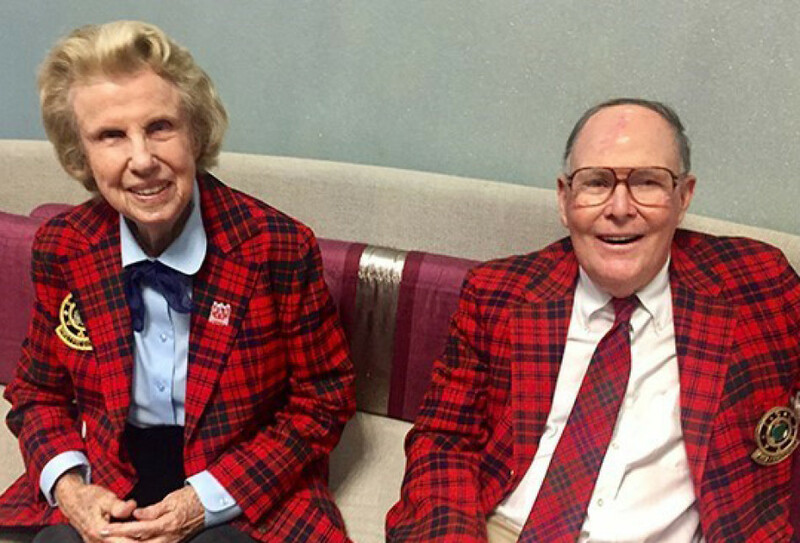 Alice Dye, the first female President of the American Society of Golf Course Architects (ASGCA), a Fellow and 2017 Donald Ross Award recipient, died Feb. 1, 2019, at age 91. The matriarch of the most famous family in golf course design - and architect of the famed 17th hole "island green" at TPC Sawgrass - ASGCA members will remember Dye for her service to ASGCA and the game of golf. Their commitment to golf course design was cemented after a tour of Scottish golf courses that followed Pete's competing in the 1963 British Amateur. "Both Pete and I were champion golfers and played famous courses, which influenced our design features," Dye said in a 2018 interview. "I think our golfing ability was significant to our design work. It helped us to make tees for all abilities, as we truly understood the game. I have worked hard on playable yardages for women," she said. Alice joined Pete in the design and construction of their first course, El Dorado (Royal Oak), now called Dye's Walk, in Indianapolis. She continued as co-designer for numerous courses, including: PGA West, LaQuinta, California; Harbour Town Golf Links and Long Cove Club, Hilton Head, South Carolina; Crooked Stick Golf Club, Carmel, Indiana; and Teeth of the Dog, La Romana, Dominican Republic. Her "Two Tee System for Women" was cutting edge, encouraging clubs to introduce an additional set of forward tees for women. A leader in golf administration, Dye served on the USGA Women's Committee and USGA Handicap Committee, the LPGA Advisory Council and on the Board of the Women's Western Golf Association. The Dyes' golf course legacy stretches far beyond the courses they designed themselves. Many of golf's leading course architects honed their craft while working alongside the Dyes. The couple's sons, P.B. Dye, ASGCA, and Perry Dye, ASGCA, have also gone on to develop their own golf course design portfolios. Many other members of the extended Dye family are now also involved in golf course architecture, including their niece, Cynthia Dye McGarey, ASGCA. Alice Dye received numerous awards and honors, including inductions into the Indiana Hall of Fame and Florida State Golf Association Hall of Fame; The Heritage of Indianapolis Award; the Don Rossi Award for Lifetime Contributions to Golf; the Women's Western Golf Association's Woman of Distinction Award; and the PGA of America's 2004 First Lady of Golf Award.